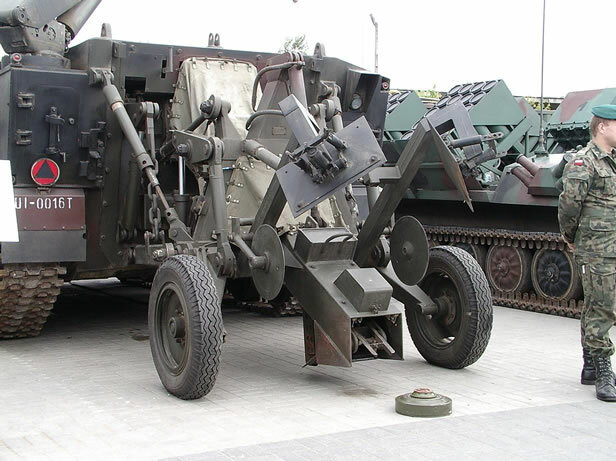 The SPG-1 is a universal Polish chassis, which the SUM Kalina was built on. The Polish SUM Kalina Mine Layer has three key sections. The main superstructure is the first, with the two crewman at the front and the two magazines which store the mines behind them. They feed the mines to the second key section, the towed entrenching device attached to the rear of the vehicle. The third key section is the boom arm crane on the left topside of the superstructure that is used to load and replenish the two magazines with mines. The two crewman can monitor the entrenching device via CCTV rigged up in their compartment. They have smoke grenade launchers and NBC filtration for self defence, as well a 12.7mm MG. The entrenching device can lay mines on the surface at speeds between 6 to 20km/h or bury them at 6 to 10km/h. Its also capable of laying mines in water such as river crossings or beach’s. The two magazines can each hold 125 of either TM-62M or MPP-B anti-tank mines. The laying of anti-personnel mines is carried out by the Kroton, a specialist vehicle of the Opal, itself an upgraded Russian MT-LB.